Over 300,000 Photo Puzzles Delivered To Satisfied Customers Since 2005. Classic Sturdy Jigsaw Puzzle Pieces In A Wide Variety Of Shapes And Sizes. The Highest Print Quality Available. Made in La Crosse, Wisconsin, USA. Fast Production. Fast Delivery Options. 100% "Love It" Guarantee Or Your Money Back. Turn your favorite pictures into custom photo puzzles! Take your digital moments and create hours of family fun. Relive photos from family vacations, wedding celebrations, or a beautiful moment. Birthdays, anniversaries, Valentine’s Day, and Christmas are all great times cherish and celebrate. Puzzles from these events make great gifts. Our simple online ordering process makes it quick and easy. Select from a wide variety of sizes and difficulty levels. Upload your photo and we do the rest. Our family-owned business focuses on delivering the highest quality custom photo puzzles. We care for are inspect your order each step of the way. Our customer service team is always available. Reach us by either phone or email to answer any questions that you may have. 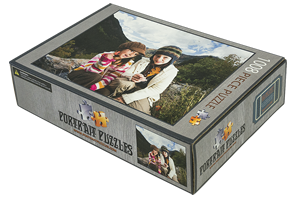 Portrait Puzzles uses the best materials, the latest printing technology, and the most tried and true cutting process. This adds up to custom photo puzzles that you are able to assemble and re-assemble many times. Our products will last and provide continued enjoyment. We guarantee that you will be thrilled with your custom jigsaw puzzle, or we will send your money back. Our custom photo puzzles make a perfect gift. We have a custom jigsaw puzzle that is right for everyone from age 3 to 103. Surprise someone today. Made in the USA by people who care. Orders ship next business day! We offer free shipping to US locations. We ship to Canada; delivered by Canada Post.